Life is a mystery. There's no one in this world who can unravel the complications of life. You have to take it how it comes. 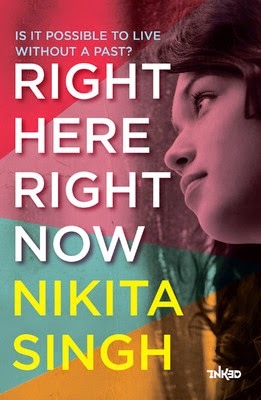 Author Nikita Singh in her latest book 'Right Here Right Now" emphasizes on importance of life for someone or some people. So has she been able to put her point across? Let's find out. Seventeen-year-old Kalindi wakes up in a hospital, little more than a clean slate. She has forgotten everything about her past, and no one knows how this happened. When she meets her parents, her friends and her boyfriend, it feels like she's meeting them for the first time. She doesn't like what she hears about the old life they tell her about, it doesn't feel right. She has no past in her mind, and struggles to come to terms with being a completely new person. Adding to the fire is her fast-approaching final examination, and she remembers nothing of what she studied at school. If she does not regain her memories, she will lose the reward of all her hard work. Even if she does, will she be happy with who she used to be? First look at the title and the cover and the innocent face and the curious tagline just tries to put it's point across to the readers. The title a big question in itself posed for the readers adds to the curiosity. The blurb talks about a girl and her condition and battle for survival. The blurb tries to hide a lot but still manages to shed some light on the story. A bit mysterious blurb would have made it more alluring. The story revolves around Kalindi Mishra who one fine day wakes up in a hospital but is not able to recollect her past. She has troubles in gathering everything around her as she finds help from various quarters but still struggles for survival in the present. Her constant fears and tirades acting as an invisible enemy and her medical condition adding to the entire set of problems. So will she be able to come out of it? Will she be able to recollect her past? What role will others play in her life? What life has in store for Kalindi? That's what the story is all about. If life is cruel then face the cruelty with a brave face and live as it comes. Emotions, drama, fear, lows, sorrows, nightmares and joy it all comes to a full circle as the plot traverses a path less travelled. The tell tale is slow yet captivating, fiction yet highly imaginative, unconventional yet mesmerizing. The whole focus on one single character and her dilemma works fine and the curiosity factor is always high in the story. The book deals with various facets of life with ease and the story never bumps off to another track. The small and big parts of other characters add up to the whole story line. The only downside of the book is it's feel of incompleteness towards the end. The curiosity from the past and nightmares could have been revealed towards the end for the readers. It didn't add up to be left like this at least for the readers. All in all the book is tantamount to the whole idea that life has quite a lot of surprises in store for you good or bad and you should be ready to face them. Lucky are those who get a second chance to live it thoroughly. The book is simple but has greatest of effects on the readers mind. It talks and evolves with every page and livens up with it's emotions. A tale to imagine and relive again and again.Life might be complicated but not the words in the book. A book to be cherished for long.